Please make your check payable to Carmina, Inc. 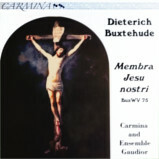 This CD features some of the wonderful music Carmina performed and recorded during its first seven seasons (1997-2004). Sacred and secular, a cappella and accompanied—you’ll find everything here! Included are works by Josquin Desprez, Victoria, Dowland, Du Fay, Monteverdi, Cornish, Gibbons, Sandrin, and Jacopo da Bologna as well as the entertaining “Happy Birthday, Beethoven!” by our then-future assistant director, Hubert Beckwith, performed at the German embassy in Washington DC on December 16, 2004. The Chesapeake Viol Consort and a number of other fine instrumentalists are featured as well. The unique and moving work known as “The Most Holy Limbs of Our Suffering Jesus” lovingly meditates upon the body of Christ on the cross. Its seven cantatas draw on the medieval poem Salve mundi salutare, selected Bible verses, and Buxtehude's keenly felt music to reflect in turn on Christ’s feet, knees, hands, side, breast, heart, and face. Composed in 1680 for the music director of the Swedish royal chapel, Membra Jesu nostri is considered the first Lutheran oratorio. The present recording was inspired by Carmina and Ensemble Gaudior’s live performances of this music in March 2015. In the summer of 2002 Carmina and Armonia Nova teamed up to produce the late twelfth-century miracle play Filius Getronis, the longest and most complex of the four St. Nicholas plays found in the Fleury Playbook. The production included staging, costumes, and props. All singers were directed in historical gesture and sang from memory. This CD is a “soundtrack” recording of the first performance, which took place on July 26, 2002 at St. Joseph’s Roman Catholic Church on Capitol Hill. 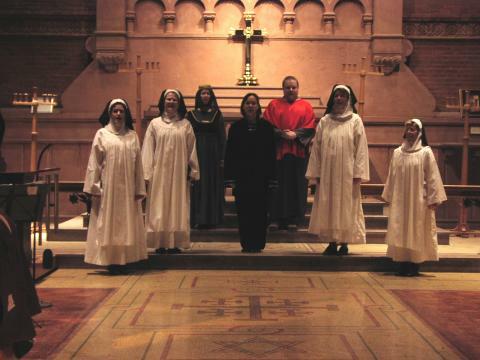 Click here to view pictures from the third performance, December 6, 2002 (St. Nicholas Day) at St. Mark’s Episcopal Church, Capitol Hill. Relive some of Illuminare’s most magical moments as they present a wide variety of works in some of the Washington area’s loveliest venues. Known primarily as an early music ensemble, Illuminare has also explored other repertories, including traditional music from the Georgian Republic and works by Johannes Brahms, particularly compositions intended for his Hamburg Frauenchor (women’s chorus). Other repertoire on this CD includes medieval English carols and works by Hildegard von Bingen, Guerrero, Landini, and Ciconia. 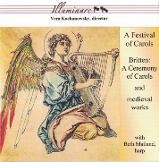 In celebration of the hundredth anniversary of birth of Benjamin Britten in 1913, Illuminare and harpist Beth Mailand performed and then recorded the composer’s beloved Ceremony of Carols (1942). Britten’s inspiration was the English medieval carol, which flourished during the fifteenth century, the epoch from which most of his texts are drawn. Fittingly, this recording includes a medley of early English carols. The Palestrina Choir of Washington, D.C.
For twenty years the Palestrina Choir of Washington graced the city with finely wrought performances of music by its namesake composer and his contemporaries. 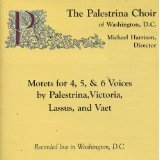 With Mr. Harrison's return to Nashville and the dissolution of the choir, Carmina has the privilege of offering this collection of music by Palestrina, Victoria, Lassus, and Vaet, recorded in concert in the spacious acoustics of St. Patrick's Catholic Church and the Cathedral of St. Matthew the Apostle.